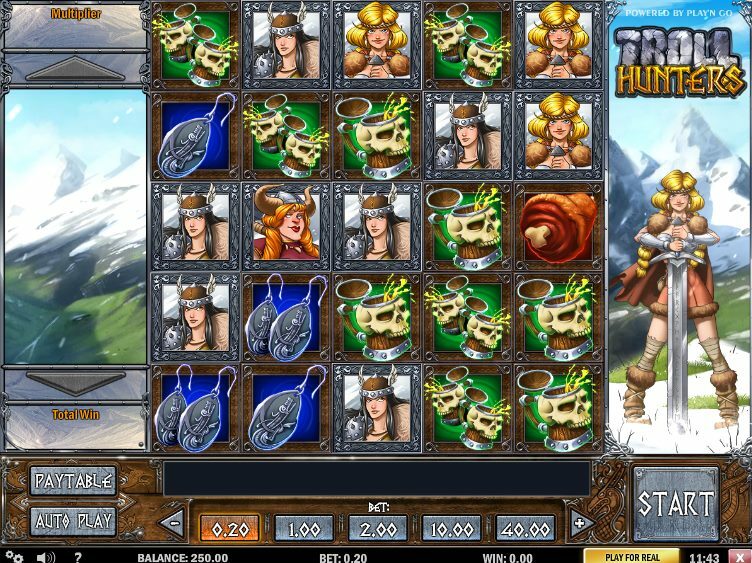 If you’re a fan of Cascading, or Avalanche Reels, as in Betsoft Gaming’s fantasy-themed slot, Greedy Goblins, or Sheriff Gaming’s Aztec-themed Oonga Boonga, get set for Play'n Go’s lush trip back into Norse mythology, Troll Hunters. In fact, fantasy is the tip here from slot developer Play'n Go, as our trip of buxom plaited Viking warriors set out to do battle with a mighty troll. On the reels are plenty of deliciously realized icons straight out of a Norse graphic novel: our three heroines, a set of ear-rings, beer mugs, and a joint of meat to feed the hungry warriors after a day’s battle. The golden Rune symbol acts Wild and substitutes for all symbols, and I found this to keep facilitating wins during the game. The grid is made up of a 5x5 board, and behind the symbols you can see the word ‘ Bonus’ cascading down the screen. As the reels spin, or ‘fall’, into place, and winning combos are formed, the winning symbols disappear to allow the symbols above to fall into their place. Also, the central symbol in any winning combo turns Wild, adding even more Wilds to the reels. During the base game, keep an eye on the left-hand panel on the screen, as you’ll accumulate multipliers as you keep triggering wins. This can keep on happening until the entire reel is cleared and the Bonus is revealed. When that happens, you’ll be taken off to a bonus free spins round, with 10 spins up for grabs. Not only that, but the free spins are multiplied by the number of 'Bonus' columns you've fully cleared. The bonus round plays out on a separate game screen, and here you’ll be presented with a tonne more symbols, like battleaxes, shields and swords. There’s also the mighty troll, who makes an appearance on the reels. Five or more matching symbols bags a win – they burst out of the ice convincingly – while five or more trolls during the bonus round triggers a further bonus round, and you can keep re-triggering for up to 20 extra rounds. With some great animation and graphics, and winning combos that don’t seem to ever stop hitting, Troll Hunters is the game to go for if IGT's popular slot Dungeons & Dragons: Crystal Caverns is starting to wane and you want something more than NetEnt's Trolls to play.